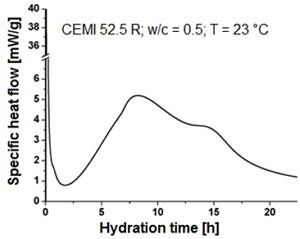 Isothermal calorimetry is a useful tool for the time-resolved investigation of cement hydration. The temperature change in the sample induced by endothermic or exothermic reactions is transferred into a heat flow signal. This allows investigation of e.g. the retarding or accelerating effect of additives. The Erlangen Applied Mineralogy Group operates two commercial TAM Air isothermal calorimeters with eight twin-type channels, each consisting of a measurement and a reference channel. By external stirring, the cement paste is mixed and transferred into a crucible, which is then inserted into the measurement channel. The Erlangen Applied Mineralogy Group has developed special devices for internal stirring (InMixEr – Injection & mixing device for internal paste preparation, FAU Erlangen, Mineralogy). Here, injection of the mixing liquid and stirring of the cement paste is performed directly in the measurement channel. 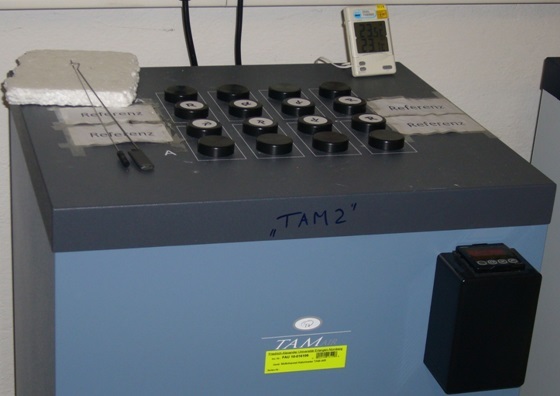 This offers the clear advantage that reliable calorimetry data can be obtained even for the initial part of the cement reaction, since initial disturbances by external factors can be avoided.